The Cotswolds epitomise the very best of the English countryside: gorgeous villages of honey-coloured stone nestling in the hills, surrounded by green fields that have been farmed for centuries. Covering over 2,000 square kilometres and the second largest protected landscape in England, visitors to the Cotswolds will be spoilt for choice with things to see and do. Here’s our list of twenty of the best places to enjoy if you’re lucky enough to find yourself in this beautiful part of the country. One of the principal towns in the Cotswolds, Burford sits on the River Windrush eighteen miles to the west of Oxford. Its high street of golden stone buildings is typical of the area. Notable landmarks include the Grade I listed parish church of St John the Baptist, the beautiful Burford Priory and the 16th century Tolsey building, once a meeting place for medieval merchants and now home to a museum charting the town’s history. Burford is a great location for shoppers, with a treasure trove of antiques shops and up-market boutiques. After flexing your credit card, why not take a break in one of its excellent restaurants and spend the night at a historic inn. Not one of the more famous Cotswolds villages – which reduces the number of tourists – but one of the prettiest. Castle Coombe is divided into two main areas: the By Brook next to the river, and Upper Castle Coombe, on higher ground to the east. The village has a collection of picturesque landmarks including a market cross, two water pumps and a parish church with what is reputed to be one of the oldest working clocks in England. There is also a luxury hotel and a golf course, and on the edge of the village something a little different – the Castle Combe racing circuit, where you can try out different vehicles or test the limits of your own. Lying on the lower slopes of the Cotswold Hills, Cirencester is sometimes referred to as the “Capital of the Cotswolds”. It has been an important town for centuries and the local Corinium museum traces its long history through artefacts including Anglo-Saxon gold, Roman mosaics and medieval sculptures. Visitors with some time to spare should head west to Cirencester Park, the country house of Earl Bathurst, to view its collections of art and spectacular gardens. As well as the pleasant walks and grottoes, the park contains the tallest yew hedge in England. The million tons of clippings produced by its annual pruning are used in the manufacture of drugs to treat cancer. As well as having the most interesting names in the Cotswolds (Slaughter is actually derived from the ancient English word for muddy), Upper and Lower Slaughter are amongst the area’s most beautiful villages. They are also extremely old: they were mentioned in the Doomsday Book of 1086. Both Slaughters lie on the banks of the tiny river Eye, a tributary of the Windrush. A ford crosses the water at its widest point and several stone footbridges connect the two sides of the communities. Amongst the historic buildings are the Old Mill at Lower Slaughter, now open to the public and housing a museum, tea room and gift shop. There is limited parking in the villages, but they are easily reached on foot via a pleasant stroll from Bourton-on-the-Water. As its name suggests, Bourton lies on a river, the Windrush, which meanders its way through the heart of the village flanked by long, wide greens. The several bridges which arch across the water have given Bourton its nickname of “The Venice of the Cotswolds”. The river is at the heart of village life and provides the unlikely venue for an annual game of medieval football. Both the goals are placed in the river itself, making this the wettest football match you’re ever likely to see. Year-round attractions include a one-ninth scale model of the village (complete with its own model village), the Cotswold Motoring Museum, and Birdland Park and Gardens, home to avian life from penguins through to parrots. Fondly known as “Chippy” to the locals, Chipping Norton still runs much as it has since the 13th century. Unlike some of its neighbours it remains a ‘real’ town, not yet overshadowed by the demands of tourism. There has been a market here since the 13th century, while the 15th century saw the town thrive with the profits of the wool trade. The great church of St Mary, with its richly decorated interiors, provides evidence of its former wealth and status. Even older than the church and market are the Rollright Stones, an ancient megalithic stone circle just to the north of the village. The circle is comprised of three monuments known as the King’s Stone, the King’s Men and the Whispering Knights. Legend has it that a local witch petrified the king and his men when the king failed a challenge, and that the King’s Stone comes to life when the church clock strikes midnight. A haven for walkers, Winchcombe sits on no fewer than seven different long-distance footpaths: the Cotswold Way, Gloucestershire Way, Wychavon Way, Windrush Way, Warden’s Way, St Kenelm’s Way and St Kenelm’s Trail. Keen ramblers should visit in May when the town holds its annual walking festival. For lovers of locomotives, Winchcombe also has a station on the restored heritage Gloucestershire Warwickshire Steam Railway. Nearby Sudeley Castle (shown above) with its nine beautiful gardens is well worth a visit, but check the website before you go: it remains a private residence and is only open to visitors at particular times of the year. Sometimes referred to as the “Jewel of the Cotswolds”, Broadway’s pretty high street is lined with a variety of shops and cafés and is known as a centre for arts and antiques. Visitors planning to stay in the town will find a variety of accommodation, including the grand Lygon Arms, a historic inn dating back to the 17th century. As well as plenty of places to eat and shop, Broadway offers two museums, the Ashmoleon and the Gordon Russell Museum, dedicated to the twentieth century furniture maker. Just outside the village the imposing Broadway Tower has a long and fascinating history. Used in its time as a beacon, a residence for famous artists, and a wartime look-out point, it is today open to visitors. Climb to the top to enjoy stunning views of the Cotswold scenery. One of the Cotswold towns to be served by its own railway station, pretty Moreton-in-Marsh has a small high street lined with golden-coloured buildings. A handful of antiques, craft and gift shops are supplemented by several good cafés and hotels. The nearby Batsford Arboretum houses England’s largest private collection of trees and shrubs, as well as glass and woodturning studios where visitors can observe the craftspeople at work. The venue hosts a variety of events throughout the year, including photography workshops and treasure hunts. The small market town of Stow-on-the-Wold is thought to have originated as an Iron Age fort. In later centuries several fairs were established there and the large market square that still stands at its centre testifies to its former importance to regional trading. Today, Stow has many fine antique shops, art galleries and crafts shops. A farmer’s market is held in the town square on the second Thursday of every month, and May and October see hundreds of visitors arrive for the Gypsy Horse Fair, held in open fields just ten minutes’ walk from the town centre. The picture postcard village of Bibury lies on the banks of the river Coln in Gloucestershire. Named “the most beautiful village in England” by the famous designer and artist William Morris, perhaps Bibury’s most photographed cottages are those found at Arlington Row. These were once the homes of weavers and wool was washed there before being taken to nearby Arlington Mill. In recent times they have been used as locations for television series and films including Stardust and Bridget Jones’s Diary. This is a village to look at and enjoy. There is little in the way of amenities, but you’ll be hard-pressed to find a prettier spot to while away a quiet afternoon. Everything you need to know about Cricklade can be summed up by the town’s Latin motto, in loco delicioso -“in a pleasant place”. Founded in the ninth century, today its main claim to fame is its large nature reserve, North Meadow. Here, the unique habitat formed by the regular winter flooding of the rivers Thames and Churn provides a home for eighty per cent of England’s snake’s head fritillaries – a pretty, purple flower which blooms in late April to early May. In June, the annual Cricklade Festival welcomes thousands of visitors from across the region to enjoy a day of free entertainment including live music, dancers, magicians and puppet shows. Tetbury’s history as an important market for the Cotswold wool and yarn trade has shaped one of those eccentric traditions beloved of English provincial life – the annual Tetbury Woolsack Races. Participants carry a 60 pound sack of wool up and down the steeply sloping Gumstool Hill to raise money for good causes. Visit on the last Monday of May to join the thousands of spectators cheering them on. Both Charles, the Prince of Wales and Anne, the Princess Royal have estates near Tetbury. You can sample some of the produce from the former in the town’s own Highgrove Shop. Whilst in the town centre be sure to check out the historic market hall and the “Chipping Steps”, once home to a medieval jobs fair. The market of Malmesbury in Wiltshire lies in the southern reaches of the Cotswolds. It is perhaps best known for its ancient abbey which provides the resting place for Athelstan, grandson of Alfred the Great and the first king to rule the whole of England. The abbey guest house was constructed in 1220 and now houses The Old Bell, which claims to be the oldest hotel in the country. The last two weeks of August see the Malmesbury carnival come to town, with the finale procession held on the first Saturday in September. Over thirty events take part around the carnival itself, including a recent attempt to break the world record for the largest pillow fight. Built almost completely of golden Cotswold stone, Stanton is considered to have some of the most distinguished architecture of any of the Cotswold villages. Its parish church, St Michael’s and All Angels, is a Grade I listed building with the oldest parts dating back to 1200. Other notable buildings include the Elizabethan Old Manor Farmhouse and Stanton Court, a manor house built early in the seventeenth century. The 102 mile footpath, the Cotswold Way, runs through Stanton. Visitors climbing the steep hill from the village to the Mount Inn will be rewarded with a real fire in winter and spectacular views from the terrace in summer. Located on the edge of the Cotswolds, the elegant Regency town of Cheltenham has been a spa resort ever since its mineral springs were discovered in 1716. The town is a great destination for culture vultures. Its main museum and art gallery, the Wilson, hosts regular exhibitions and events throughout the year, while music lovers can sample from three regular festivals – the Cheltenham Music Festival, Jazz Festival and the somewhat more niche Ukelele Festival of Great Britain. For sports lovers, the Cheltenham Cricket Festival features Gloucestershire County Cricket Club, whilst March sees Cheltenham Racecourse host yet another Cheltenham Festival, the National Hunt horseracing meeting. Another of the Cotswold towns to have a rich history in the wool trade, today Chipping Campden is a popular destination for tourists looking to sample its independent shops, cafés and restaurants. Cultural attractions include a literary and music festival, while there are many pleasant walks through the town and surrounding countryside. Chipping Campden has hosted the annual Olimpick Games since 1612, with sports including the painful skin-kicking, the destructive piano smashing, and the inexplicable “dwile flonking”, involving two teams of dancers and a wet rag. Fireworks, a torch-lit procession and dancing mark the end of the festivities, which take place on the Friday after the Spring Bank Holiday. Founded in the eighth century, the small market town of Northleach near Cheltenham has a population of fewer than 2,000 people. The compact town centre has changed little in over 500 years: small alleys lined with half-timbered houses lead off the marketplace, and it is rumoured that a maze of tunnels and vaults lie beneath the streets. Most of the shops in Northleach are independently owned and offer everything from bread and cakes to dolls houses and music boxes. Visitors looking to extend their stay will find a good selection of accommodation, pubs and restaurants. The tiny village of Snowshill, with its fewer than 200 inhabitants, makes up for in beauty what it lacks in size. It is also one of the most fragrant of the Cotswold villages, home to 35 acres of lavender fields at Snowshill Lavender. Visitors to the farm can purchase lavender products, plants and local crafts. Just outside the village lies Snowshill Manor, built in the 16th century and now owned by the National Trust. Built in Cotswold stone, it is notable for housing the collection of one of its former owners, Charles Paget Wade. Wade’s tastes were nothing if not eclectic, and visitors can view objects including alarm clocks, toys, musical instruments and 26 sets of Japanese samurai armour. The otherwise unassuming town of Bladon is notable for one reason: it is the resting place of probably the most famous Englishman of the past 100 years, wartime Prime Minister Winston Churchill. 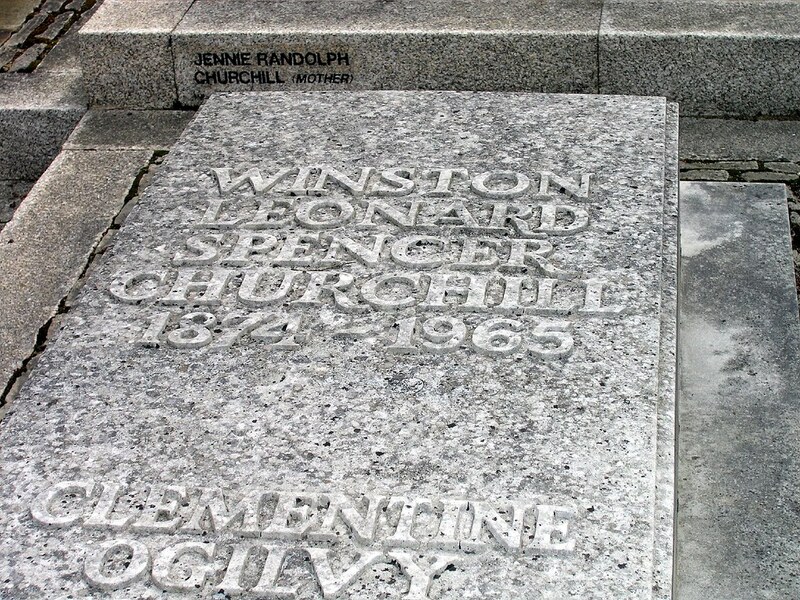 Generations of Churchills lie in the small churchyard of St Martin’s. Winston’s wife, Clementine, who died twelve years after her husband is buried in the same grave. Now that we’ve whet your appetite for the Cotswolds, why not take a look at our gallery of ten stunning Cotswolds cottages.